1.1. The earliest form of organized Music that we know about is the Music of Sama Veda or the Saman. Sama Veda is linked to music through Yajna. The Yajna-s, were at the very heart of the Vedic way of living. During the Yajna-s, it was customary to invoke and invite devas (gods) by singing hymns dear to them or dedicated to them ; and to recite the mantras while submitting to them offerings (havish) through Agni, the carrier (havya-vahana). The group of priests who sang (Samaga or Chandoga) the Mantras, initially, compiled a text for their use by putting together selected Mantras from Rig-Veda (the oldest known text) that could be sung during the performance of a Yajna or a Soma Yaga. That collection of lyrical Mantras came to be known as Sama Veda Samhita; and was regarded as the fourth Veda. 1.2. Out of the 1,549 mantras in Sama Veda Samhita, as many as 1,474 mantras are taken from Rig Veda (mainly from the eighth and the ninth Mandalas). Most of the mantras are in Gayatri chhandas (metre), while some are in Pragatha. It is said; the term Sama is composed of: SA, which stands for Rik (Vedic Mantra); and AMA, meaning various notes (Brihad Up: 1-3-22). Sama Veda is thus, virtually, a musical rendering of the selected mantras from Rig Veda. In other words, Sama took maathu (words) from Rig Veda; and provided dhathu the musical substance to those words. Sama Veda is perhaps the earliest known musical literature. 1.3. The Sama Veda Samhita has two segments. The first segment is called Sama – Yoni (adhara) mantra Samhita, meaning that it is the basic text. This segment contains the selected mantras as they appear in the Rig Veda .This, virtually, is the source book. The second segment called Sama–gana text. Here, the mantras are not in the order they originally appear in Rigveda. But, the selected mantras are rearranged to suit the sequence of rituals during the Yajna; or according to the meters (chhandas) or the gods to whom mantras are addressed. 2.1. While rearranging the text for the purpose of singing, the selected mantras are converted to Saman by turning, twisting, elongating its syllables; and, by inserting various modulations, rests, and other modifications. The musical effect or the ‘floating form’ of the Sama-gana is enhanced by interpolation of Svaras and meaningless sounds called Stobha (which resemble shouts of joy) such as: Hoyi, Hoi, Hova, Hai, Haw, Oi, Ai, Ha, Ho, Uha, Tayo, etc. This is the text for singing; expanding each mantra with notations and instructing how mantras are to be sung. This is the Sama Veda as it is generally understood and sung. 2.3. In any case, of the many, only three recessions (shakhas) Viz. Kauthumiya, Ranayaniya and Jaiminiya, have survived. The Kauthumiya and Ranayaniya carry the same set of mantras; but their internal grouping differs; and there are also variations in their svaras (accent). The Jaiminiya is said to be different from the other two, in both the aspects. Of the three shakhas, Kauthumiya is regarded the prominent one. 3.1. Throughout, Sama Veda is arranged in two streams of classification. And, the two often interrelate. One is Arcika, the way in which Sama Veda text is structured and the way its Riks (stanzas) are grouped. The other is Gana, the musical aspect which details the manner of singing the Sama Riks. First, Archika (group of Riks sung in adoration), is essentially the collection of the texts (yoni) of individual Riks adopted from Rigveda. Here, the selected Riks from Rigveda are put together under several chapters (prapathakas). And, under each prapathakas; the Riks are bunched into sets of ten (dasasti) or less. 3.2. The Sama Veda text is broadly made into two Arcikas. The first Arcika (Purvarchika or Shadarchika) is made of six chapters (prapathakas) together with an Appendix. The Purvarchika consists about 650 Riks selected from Rigveda that are grouped partly according to meters (chhandas) and partly according the gods (devatha) that are propitiated. The first five prapathakas have about 585 Riks to be sung in honour of Agni, Indra and Soma-Pavamana. The sixth prapathaka having 55 Riks is called Aaranya or Aranyakanda. There is also an Appendix consisting 10 Riks attached to Purvarchika; and is called Mahanamani (or Sakravayah) to be sung in honour of Indra the Great (Mahan). 3.3. The second Arcika, Uttararcika (that which follows the first) is made up of nine prapathakas divided into number of segments (khandas). Under these Khandas, about 900 Riks are grouped into about 300 songs of three Riks each. The Riks, here, are arranged according to the sequence of events that occur in the course of the performance of the Yajna. It is presumed that the Uttararcika is, comparatively, of a later origin. And, it is regarded as an essential supplement to the Purvarchika. 4.1. As regards the Gana, the musical element of the Sama Veda, the Riks included in the first five chapters (prapathakas) of the first Arcika (Purvarchika) and those under Mahanamani are known as Grama-geya-gana – that is the songs meant to be sung in homes in the villages – praying to gods (devatha) Agni, Indra Soma and Visvedevah – during the course of domestic functions such as Brahmayajna (teaching of Vedas), Upakarma and other worships. The Riks included under the sixth chapter (prapathaka) of the Purvarchika – that is Aaranya or Aranyakanda – are meant to be sung in the solitude of forests. Hence, they are named Aranya gana. The singing is of contemplative nature; and, it is deemed as sacred-music. The Purvarchika way of singing (both the Grama and the Aranya gana) is deemed Prakrti-gana, the natural way of rendering a song. And, it appears that the hymn-melodies for the Soma-yaga performed at homes in the villages (Grama) were different from those performed by the hermits living in the forests (Aranya). 4.2. As regards the singing (Gana) of the Riks included under the second Arcika (Uttararcika), it basically consisted two kinds of songs: Uha-gana (numbering 936) sung during the Soma Yajna; and Uhya-gana (numbering 209) singing within oneself. The texts (yoni Riks) of most of the songs were adopted from Purvarchika. But, here, the singing style is improvised with unusual variations; and, therefore it is named Vikrti-gana (not the straightway of singing). It is also said; the same Rik can be sung in different tunes, producing different Samas. The number of such Samas can vary from one to eighteen..! In summary; The Sama Veda Samhita, is arranged in two primary sections – the verse books (Arcika) and melody books (Gana). The Arcika is divided in two parts: Purvarchika and Uttararcika. And, as regards melody (Gana) there are four styles of singing hymns: Grama-geya-gana; Aranya-gana; Uha –gana; and; Uhya-gana. There is a mutual relation between the Riks contained in Arcika and the Gana books. 5.1. The priests who sing the Mantras at the Yajna are designated as Udgathru-s (derived from udgita – to sing ’high’ or loud). The Sama Veda Samhita came to be compiled, essentially, for their use and guidance. They were usually a group of three singers (Prasthothru, Udgathru and Prathiharthra). And, the group, together, rendered the Sama in five stages. Prasthava: The initial portion of the mantra is sung by an Udgathru designated as Prasthothru. And, he starts with a deep Huuum sound (Hoon- Kara). Udgita: Prasthothru is followed by the chef Ritwik (designated the chief Udgathru) who sings his portion of the Rik. He commences with an elongated Om Kara. Prathihara: the mid-portion is sung loudly by Prathiharthra. This adulates the Devatha to whom Rik is addressed. Nidhana: the final portion is sung by all the three together, commencing with prolonged Om-kara. When a mantra, as per the above format, is sung three times, it is then a stoma. Some texts describe the set of these five stages (Prasthava, Udgita, Prathihara, Upadrava and Nidhana) as Bhakthi. Its number is extended to seven by adding Hoon- Kara and Om Kara. 6.1. 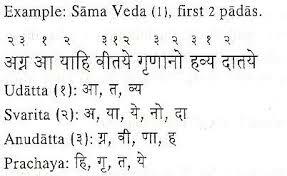 Shiksha, a branch of Veda lore (vedanga), deals with elements of chanting and phonetics. According to Taittereya Upanishad (1. 2), the elements of chanting includes six factors: Varna (syllable); Svara (accent); Maatra (duration); Balam (stress); Sama (even tone) ; and Santana (continuity) . The first four deal with correct pronunciation of individual syllables; and the last two with the recitation of the entire line or the verse. Briefly, Varna is the correct pronunciation of every isolated syllable, combination of consonants and ovals and compound letters. Svara is how a syllable has to be pronounced in one of the three accents (udatta, anudatta and svarita). Maatra is the time duration for pronouncing a syllable. There are of four types: hrasva– a short one – duration for short ovals; dhirga – two unit-duration for long vowels; plutam- longer than two–unit duration; and, the fourth is ardha- maatra, half unit, meant for consonants not accompanied by vowels. 6.2. In the beginning, Sama-gana employed only three notes called Udatta, Anudatta and Svarita. The lyre (Vana-Veena) accompanying the singing had only three strings, one for each note. The songs were perhaps like Ga Ga -Re Re -Sa Sa Sa. This kind of singing might have suited for chanting hymns. The three notes were differentiated depending on whether it was produced from above or below the palate (taalu). Udatta refers to sound produced from above the palate; and is acutely accented (uchchaih). Anudatta was gravely accented (nichaih); produced from below the palate. Svarita is a combination of udatta and anudatta, with udatta in the first-half. It is called a circumflexed accent. 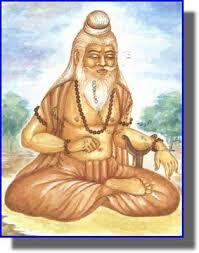 It is said; in the beginning, the (Rig) Vedic priests used only three notes : Udatta, Anudatta and Svarita. The singers of the Sama Veda discovered some more notes and extended the range from these three Svaras to seven svaras. Narada (NarS 1.1.12) identifies the seven Sama Svaras (Vaidika) as: Prathama; Dvitiya, Triya; Chaturtha; Mandra; Krusta; and Atisvara. And then, he correlates the Sama Svaras used by the Saman singers with the notes of the flute (Venu) – according to the Laukika music (NarS 1.5.1). Narada offers an explanation that from the ancient Udatta the Svaras Nishada (Ni) and Gadhara (Ga) were derived; from Anudatta, the Svaras – Rsbha (Ri) and Dhaivata (Dha); and, from Svarita emerged three Svaras: Shadja (Sa), Madhyana (Ma) and Panchama (Pa). Swami Prajnanananda in his A History of Indian Music explains the right hand and figure gestures that the Saman singers used to indicate the Svaras (tones) of the Saman that they were singing. In the Vedic period, the base-tones (sthana-svaras) like Udatta, Anudatta and Svarita, together with the Savras, such as, Prathama, Dvitiya, etc., were used to be symbolized by different positions or movements of ‘the fingers of the hands as well as by different movements of the upper parts of the bodies of the Saman singers. The tradition of expressing the tones of the Vedic music, by moving the fingers of the right-hand, is current and common to this day, at least, with the followers of the Ranayaniya and the Kauthuma recessions (shakhas) of the Samaveda. (e) the last finger (kanisthika) used to denote the Chaturtha and the Mandra of the Saman. The thumb was made to move and touch the other fingers, and thus helped the singers to sing the Samagana with proper intonation. Now , the hand-poses (mudras), which are adopted in the religious functions (puja) and others (updsana-mudras) as well as the gestures adopted in the art of dancing (nartana-mudras), are all evolved from the Mudras employed by the Saman singers. While in writing down / copying the Vedic and Saman text , the Udatta and Anudatta etc were indicated by symbols. In the written/printed texts of the Rig Veda, Udatta is not indicated by any symbol; Anudatta is indicated by underlining the syllable; and Svarita is indicated by a vertical line above the syllable. The Sama–gana texts, however, indicate Udatta by writing the Sanskrit numeral –one above the letter; Anudatta by writing the numeral–three above the letter; and Svarita by writing the numeral–two above the letter. In the Sama text, the syllables that have no symbols are called prachaya. In the later Sama texts, it became customary to write the numerals (one to seven) on top of the Sama mantras to indicate their note-delineations (Sama vikara). 7.2. As Sama-gana originated from the Yajna, its purpose, at least in the initial stages, was limited to chanting by the Udgathrus. Later, as the Sama Music developed, the number of notes increased from three to four, then five (which continued for a very long time), then six and finally seven. With that, the number of strings of the lyre too increased. Thus, over a period, the Sama scales expanded from three to seven notes. (It is not clear when or at what stage seven notes were introduced into Sama). 7.3. Naradiya Shiksha is a text that deals mainly with the musical notes and the pronunciation of the words in the Vedic language. Some believe it might pre-date Bharata’s Natyashastra. Narada Shiksha explaining the Sama music states that there were three Gramas (Sadja, Madhyama and Gandhara). It also mentions that each Grama has seven Murchanas (a total of 21 Murchanas). (But, it does not define Grama or Murchana). The set Murchanas related to Gandhara Grama are meant to please Devas; and the other two to please Pitris and Rishis. In addition, it mentions 49 Taanas. 7.4. Naradiya Shiksha relates the Sama Svaras to the notes on the flute (Venu) as: Ma, Ga, Ri, Sa, Dha, Ni, and Pa.
Narada says: Prathama, the first Svara of the Saman singers is the Madhyama Svara of the Venu (flute); Dvitiya, the second, is Gandhara; Tritiya, the third, is traditionally the Rsabha; Chaturtha, the fourth, is said to be Shadja; Panchama, the fifth, is Dhaivata; Sasta, the sixth, is considered to be Nishadha; Saptama, the seventh, is the Panchama. Shadja (Sa): Because, it is situated in the nose, the throat, the chest, the palate, the tongue and the teeth; and, because it springs from these six , it is traditionally called Shadja. Rsabha (Ri): Because, the air, rising from the navel and striking the throat and the head, roars like a bull, it is called Rsabha. Gandhara (Ga): Because, the air, rising from the navel and striking the throat and the head, blows smells to the nose and is delicious; for that reason it is called Gandhara. Madhyama (Ma): Because, the essence of the Madhyama is in the air, which rising from the navel, striking the chest and the heart, reaches the navel as abig sound. 8.1 .Naradiya Shiksha (1.5.3; 1.5.4) explains that each Sama-svara was derived from the sounds made by a bird or an animal in its appropriate season. For instance; the peacock crys was Shadja (Sa); the bulls roar was Rishabha (Ri); sheep-goat bleats was Gandhara (Ga); kraunchaka’s (heron) cry was Madhyama (Ma); koel’s (cuckoo) melodious whistle was Panchama (Pa); the neigh of the horse was Dhaivata (Dha); elephant’s trumpet was Nishadha (Ni). Please see the table below. 9.1. As can be seen, the Sama notes were of Nidhana prakriti (diminishing nature) or Vakragati, following Avaroha karma, a descending order (uttarottaram nicha bhavanthi). Dr. Misra says that the ancient musical scale using notes in descending order can be translated into modern Shadja grām by considering the Madhyam to be Shadja and moving up the scale. Because of that re-orientation of the Sama scales a well-structured system of music could be erected and developed during the later ages. This, surely, is one of the most significant contribution of the Naradiya Shiksha to the growth and vitality of Indian Music in all its forms. Further since the Raga concept was, then, yet to be evolved, there might not have been much depth and variation in the rendering of Vedic or Sama music. As Dr. N.Ramanathan, a noted musicologist remarked, Sama music was to acquire the rhythmic-time- patterns. That is to say, the taala system was yet to evolve. 10.1. The Sama music, in its later stages, was just ripe; and it was also eager to grow and expand both in scope and content. Historically, the Sama chanting is recognized by all musicologists as the basis for the Indian Music. The roots of Sangita, the traditional (classic) Indian Music are firmly founded in Sama- gana. 10.2. The Saman initially gave rise to a body of devotional songs called Marga or Gandharva sung in Jati (melody). No matter who sang and in which region it was sung, the Sama and the Marga music had to follow the traditional approved format. As a result of the disciplines evolved over the ages, a well structured system of music could be erected during the Gupta period on the foundations of the Sama–gana. It was during this period that Indian music started gaining the form with which we now are familiar. 10.3. From Marga, the devotional music (Vaidika) , was born the Art music (laukika) Desi, the Music of Ragas. Desi, the one derived from regions, sprang from the common people; and, it varied from region to region. Desi was inspired from life, spontaneous and fluid. 10.4. Then for over a thousand years the Music scene was dominated by a structured Music (Nibaddha-samgita) format called Prabandhas (a type of Khandakavya). Since Prabandha grew rigid it had to give place, by about 17th century, to varieties of free flowing (Manodharma-samgita) such as Padas, Kritis or Kirtanas, Varnas, Javalis etc. 9.5. Of late, the Marga and Desi; the classical folk and other improvised forms Of Music are coming together, enriching and inspiring each other. It is wonderfully delightful development. 11.1. Music in the Vedic times was sung and played for entertainment. Its other main use was during the performance of the Yajna; and it was here that Sama-gana was born. The concept of Nada-Brahman does not appear in Rigveda or in the early Upanishads. The metaphysical concept of Nada – Brahman is not discussed either in Sama Veda or its recitations (shakhas). It seems to have come from Yoga or Agama. Similarly, the notion that music would lead to spiritual development did not seem to have existed then. 11.2. It was only in the later texts, say of 4th to 6th century AD, such as Brihaddeshi, Vayu Purana and Naradiya shiksha assigned the musical taanas, names of the various Yajnas; and said that the benefits of those yajnas could be obtained by singing the relative taanas. It seems , at that stage, the idea that music was a way to liberation (moksha sadhana) was yet to get established . [ In the later times, Music was elevated to the status of a Veda ; and , came to be reckoned as the fifth Veda (Panchama Veda). It was, therefore, held in high esteem and invested with an aura of spiritual pursuit (Sadhana), leading to liberation from earthly-attachments. It is said; for both the performer and the good-hearted listener (sah-hrudaya), pure-music (Samgita) can be a fulfilling blessed experience. And much later, Abhinavagupta, commenting on Natyashastra, remarked that Gandharva bestows bliss and leading towards Moksha. Such Music , he said, is a worthy offering to gods. And, gods would be delighted with sublime Music than with reading Puranas or lecturing on Yoga exercises. The recital of poetry, performance of dance (drama) along with songs and instrumental music are equal in merit to the recitation of Vedic hymns. I have heard from the god of gods (Indra) and even from Shankara (Shiva) that music (vocal and instrumental) is indeed purer and superior to taking a ceremonial dip in a river and repeating a mantra (Japa) a thousand times. Whichever places that reverberate with the auspicious sounds of songs and music of Natya will forever be free from inauspicious happenings. 12.1 Vocal music was accompanied by lot of musical instruments in the Rig-Veda. Some of the instruments of Rig-Veda are: Dundubhi, Vaana, Nadi, Venu, Karkari, Gargar, Godha, Ping and Aghati. The sound of Dundubhi has been described as sound of clouds. Veena commonly denoted string instruments. The other instruments mentioned are: Venu or Vamsha (flute) and Mridanga (drums). 12.2. The string instruments such as Veena were played during a Yajna. Vana was the most popular string instrument of Vedic period. Among string instruments, frequent references were made to the bow-shaped harp Vana. Vana (RV 1.85.10; 6.24.9 etc.) was a lyre; a plucked string instrument like a harp. Rig Veda (10.32.4) mentions the seven tones (varas0 of the Vana (vanasya saptha dhaturit janah). Karkari (RV 2.43.3) and Tunabha were also veena – like string instruments. The other kind of string instruments mentioned in Rig-Veda is Kand-veena, which was made by combining together bamboo joints and stretching strings on it. The other kinds of Veena mentioned are : Aghati, Ghatlika or Apghatika, Pichchola or Pichchora stambalveena, Taluk Veena, Godha Veena, Alabu, and Kapishirshni etc. In fact, all string instruments were called Veena. Naali (RV 10.135.7) was a wind instrument similar to flute. Dundhubhi (RV 1.28.51; 6.47.29 etc.) was a conical shaped drum with two faces, made by hollowing out a block of wood and stretching an ox’s hide over the mouth. It was played with a stick. Adambarara was also a drum made from Udambara tree. Shanka vadya blowing of conch is also mentioned. SA & PA are constant. Others have two levels (sthanas). Thus there exist twelve swara sthanas. Four more having shades of other swaras – Suddha Gandharam, Shatsruti Rishaba, and Suddha Nishada & Shatsruti Dhaivata – make up a total of sixteen. 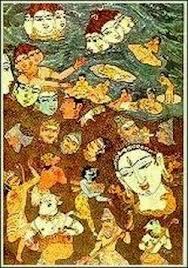 72 Sampoorna Ragas having all seven swaras both in ascending (arohana) & descending (avarohana) emerge as Mela ragas. Each mela has all the seven swaras but drafts varying swarasthana formulations. Each mela raga applied to permutations & combinations of swara sthanas gives scope to 484 janya (sub) ragas. 72 mela ragas have thus a potential to give the colossal 34776 janya ragas. Of course, this is only an arithmetical projection & not a melodic feasibility. Of 72 Melas, the first 36 have M1 & the second 36 have M2. Thank you for quite a detailed article in the Brahmanical Sama Veda. However, Krishna in The Bhagwad Gita was not talking about the Brahmanical Sama Veda when he said, “amongst Vedas I am The Sama Veda”. The Bhagwad Gita clearly does not mean that the tunes/melodies of the Sama are the most important! There is another Sama Vedas — aka Dhamma Vedas, this was revealed by Lord Buddha! This is known as the Nikayas or Tripitika — unfortunately preserved by every nation except India. Krishna when he said he was the Sama Veda meant “to be in tune”– to be in tune with what? The Dharma! Dissonant and harmonious (visama and sama): Throughout ancient cultures, the terminology of music was used to describe the moral quality of people and acts. Discordant intervals or poorly-tuned musical instruments were metaphors for evil; harmonious intervals and well-tuned instruments were metaphors for good. In Pali, the term sama — “even” — describes an instrument tuned on-pitch. AN 6.55 contains a famous passage where the Buddha reminds Sona Kolivisa — who had been over-exerting himself in the practice — that a lute sounds appealing only if the strings are neither too taut nor too lax, but “evenly” tuned. The true Sama Vedas is not knowledge of musical notes, it is knowledge and living in tune with the universe through the Dharma Chakra. Thank you Dear Saddha for your detailed explanation. thank you for the comments. i am glad you could relate to it. the later portion of the blog, i fear, became rather technical. that was a wonderful blog. i have to read it again & assimilate a lot of things. just loved it. pranaams to you. you are great ! sir, i posted a short blog on colors and music. may see if time permits. thank you for your detailed response. i greatly appreciate the gesture. i understand, in sound → color synesthesia, individuals experience colors in response to tones or other aspects of sounds. a lot of that subject is highly technical, and i do not pretend i understand all of that. i am posting a few words from the little i know and from what i read. the theosophists too, especially madam blavatsky, putforward theories relating colors to the seven types of constitution of man and the seven states of matter. (please check- it is in the same page).she was primarily trying to relate the aura in and around the human body to their colors. you made a mention, also, of ragas and colors. the indian music made attempts to translate the emotional appeal of a raga into visual representations. that gave rise to schools of paintings called ragamala, in which each raga was personified by color, mood, a verse describing a story of a hero and heroine (nayaka and nayika). the colors, substance and the mood of the ragamala paintings were determined not by the individual notes that go to construct the scale of a raga, but by the overall mood , bhava and context of the raga. in the traditional indian morphology, the colors of the deities represent and convey their attributes. for instance, the highest divinities with sublime attributes (gunas) are sky blue signifying their true infinite nature; shiva, the ascetic the supreme yogi is gauranga the colorless- without any attributes; hanuman and ganesh are red like the blood full of energy, vitality and life; and kali’s black does not signify absence of color but is the sum and culmination of all colors and energies in the universe. coming back to your subject, you might be interested to check the site that talks of people who “see” music, or sounds. the article says it is another common form of synesthesia, to have colors associated with specific tones, so that listening to music becomes a more intense and complex experience. with your scientific training and background, i am sure you would be in a better position to appreciate it. i am told there are musicians in hollywood who find that letters and numbers represent colours, rainbows of textures, rainbows of moods and feelings too. there have been attempts in the other direction too,of translating individual colours into music with the aid of compute r graphics. i understand there are schools that help the aspirants’ to hone their synesthesia condition. much study needed to understand this phenomenon. some civilisations have 5 tonal octaves, some have more. all have to go through till the chromatic notes are (re-)discovered, independently. civilisation has been here longer, and degraded and then revamped. music has always been on the ascendancy! I liked reading your post- will be keeping note of this! Your article is mind blowing for person like me. Do you know me? Or my music? Am I in your city? What is you phone number and address? Dear Shri Sablu, Yes, as you said, it might very likely be by chance you bumped into this old blog while you were lost in the ‘Recent Comments’ page. Thank you. Since you consider it ‘mindboggling’ for a person like you, I reckon you would be interested in a few other articles I wrote on music. The ones that quickly come to my mind are: The state of music in the Ramayana; Sri Mutthuswami Dikshitar and Hindustani music; the Music of Sri Mutthuswami Dikshitar; and the music of Shri SRajam (a great musician scholar and a creative artist; he was the uncle of our Shri VS Gopal who writes and sings delightfully on Sulekha).You may like to click on the links. As regards the several things you mentioned in your comment as also in your note, well… I usally live in Cincinnati –OH; and Bangalore is the location with reference to which I check news updates etc. I am now visiting India; may be here for another couple of months. I am truly not surprised if you have not noticed me on Sulekha during all these four years. The reasons are many and they are quite simple: I am not very active on Sulekha; I did not participate in any of the tag –games; I have also not contested in the ongoing EYC series; most of the friends who kept in touch with me have since migrated out of Sulekha; now, I do not know many; I have not written or commented much; not many read what I write and, what I have posted is truly not readable (many have groaned about the length). A bright star on the Sulekha horizon once referred to me as ‘the guy who writes about the dead who do not contradict’. I consider that sums me up pretty well and almost aptly. The reasons for not knowing me, you see, are quite many. They are all valid; and without prejudice. It’s OK.
Sablu…Yes, I have, of course, seen the name many times spoken with affection, warmth and regard. I am aware; Sablu is popular and is among the elite here. That is great. And, about why I have not checked into Sablu music: I usually log into Sulekha late in the night when most have done with the computer and gone to bed. I said ‘most’ because, the one who keeps company with me is a little boy of just over three; and he delights in running round the house, up and down the stairs, jumping and turning somersaults when no one disturbs him. During those silent hours I prefer to just read or write than turning on music. I normally spend no more than ninety minutes a day on Sulekha. Now that I will be here where I am surrounded by sound all the time, I will surely check into your link with pleasure and listen to that with delight. I’m highly honored by your kind words and great response. I will love to read thousands blogs of yours in music which made me so glad today to go through your precious blog. Boss such thing is gold and silver even I invest lakhs I will not get such relevant info. Does not matter you listen to my music as per your convenience and leisure.So you are actually in OH. Oh I’m so sorry I thought you are Bangalore based. Please do welcome here. And please do write more music blogs like you wrote on samveda. i will go through one by one as you also mentioned some links in your comment. Kudos to your great knowledge and I touch your feet. Dear Godwin, Thank you for breathing fresh life into an old and a forgotten blog. Thank you also for the corrections suggested. I shall try to edit the blog. But, the problem is that in the present state of Sulekha editing a blog is a risky proposition. I shall wait for a while // Para// Btw, I noticed in the scholarly essay “Samaveda und Gandharva” included in the book “Ritual, State, and History in South Asia: Essays in Honour of J.C. Heesterman “(page 146) it is mentioned that “Madhyama = F28; Gandhara = E; Rsabha = D; Sadja= C; Dhaivata = A; Nishadha = H; and, Panchama = G” . Please let me have your views before I try to edit the blog-post.// Para// Here is the link to the article “Samaveda und Gandharva”http://books.google.com/books? Wow… It is great to see you trying to chant. But, Maa, it is not easy; and, definitely you cannot get it right unless you are trained and guided by a teacher. It has to be a face-to-face exercise; and has to be practiced diligently, over a period. By the way, the indications on the top of the letters are numerals (from one to seven) to suggest their note-delineations (Sama vikara). The numbers on top are note delineations. and , where it is written within brackets as Dve or Tri , it means that the words have to repeated two or three times . Follow the text as you listen carefully. pavamAna ruchAruchA devo devebhyaH sutaH . vishvA vasUnyA visha .. 905 ubhayataH pavamAnasya rashmayo dhruvasya sataH pari yanti ketavaH . adI pavitre adhi mR^ijyate hariH sattA ni yonau kalasheShu sIdati .. If you are seriously interested , please secure the guidance of a learned teacher. I am not a research scholar in music and I am simply a student who is learning Indian classical music of basic level. I am trying to find out the reason behind the selection of ten thaats by Pandit Bhatkhande out of thirty two number of available thaats. One of the probable reasons is that the thaats have been designed to match with the ragas collected by him, as such, it is alternatively known as “Dashamel Paddhati”. The synchronization of different ragas with the developed thaats is entirely based on his personal wisdom and, therefore, many of the researchers do not agree with him regarding his selection. There are numerous literature on thaats but I do not find any satisfactory answer. You are an author who has tremendous knowledgeable in the subject of music and I hope that you will be able to throw some light on this particular issue. I convey my sincere regards to you.